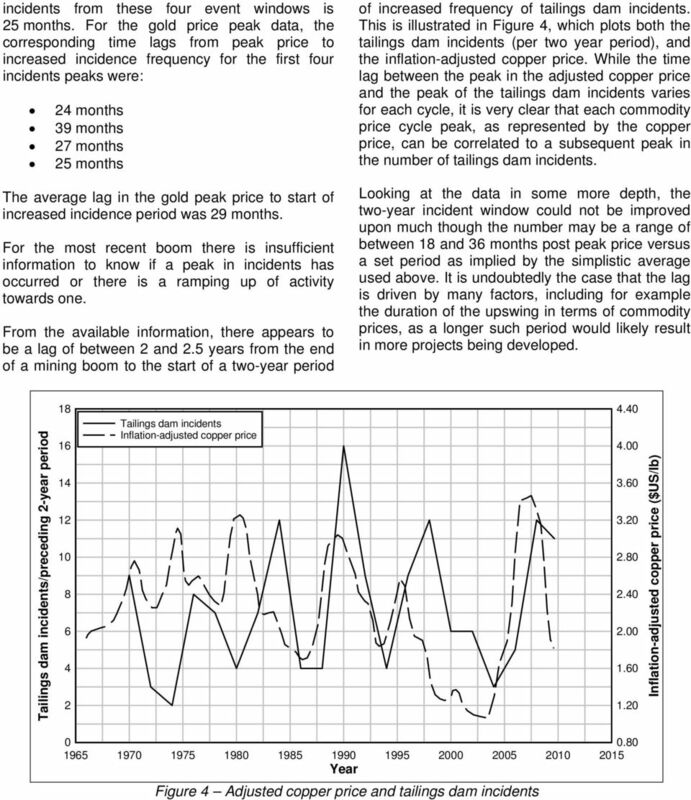 Download "MINING MARKET CYCLES AND TAILINGS DAM INCIDENTS"
2 and plots these incidents on a per two year basis. The data used to develop Figure 1 are considered more thorough post approximately 1992 as since that time, it is more difficult to have incidents that go unreported. The two year basis was selected to provide a better sampling of the information and due to how it worked with trends presented later in this paper. In each case, the date provided is the end of the given two year period for which the data is provided. For the last data point, which is August 2009, the period of record is only 20 months versus 24 for all other periods noted. 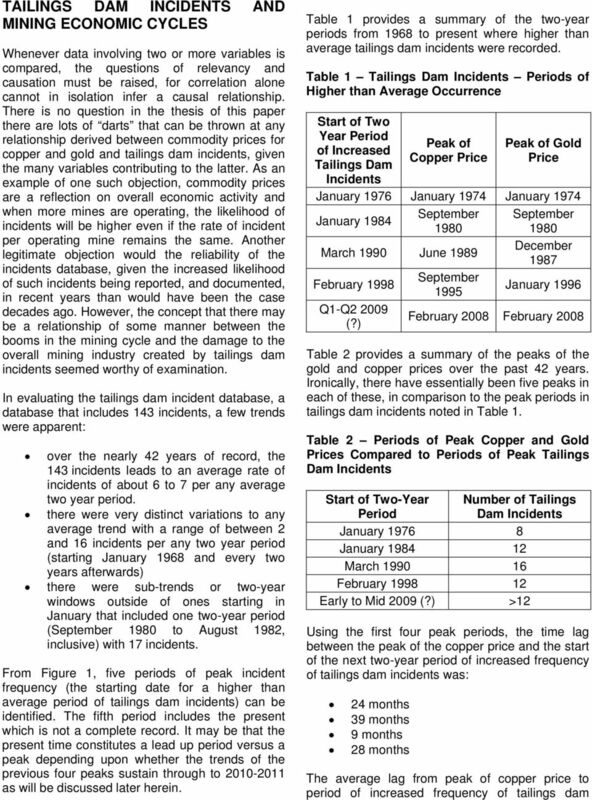 20 Number of incidents (per preceding 2-year period) Year Figure 1 - Tailings Dam Failure Incidents 1968 to ? 12 From Figure 1, which makes no attempt to regionalize or discretize the data by failure mode for the purposes of this paper, peaks and valleys in the temporal distribution of failure events certainly appear to exist with several cycles of increased incident frequency apparent, raising the question as to the drivers behind these cycles. MINING MARKET CONDITIONS The global mining market constitutes a diverse number of commodities mined and marketed across all regions of the world. The historic global market conditions and trends for each of these commodities are individually complex and worthy of extensive evaluation in their own right (which they do, and will continue to receive). Perhaps the most predictable aspect of these conditions is their unpredictability. 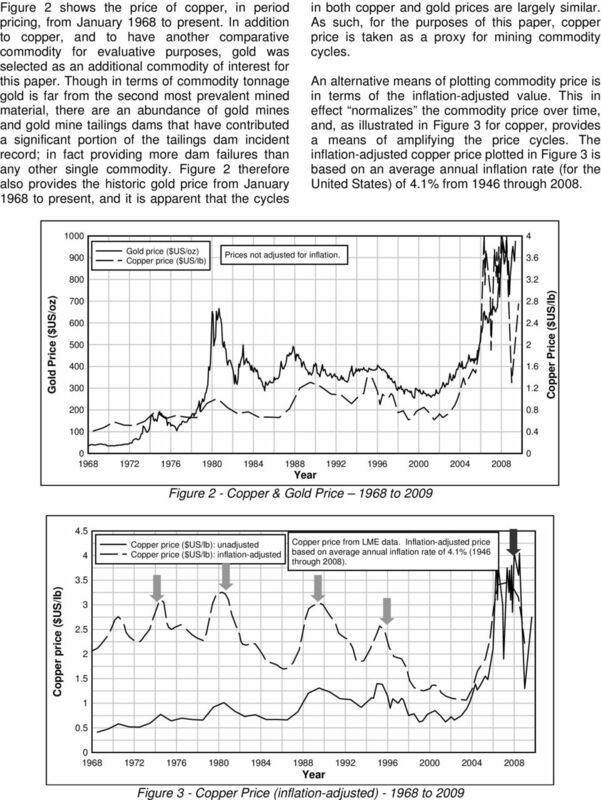 For example, while there are no shortage of supposedly prescient experts now assuring the industry they had the dramatic Q3-Q fall in mined commodity prices fully predicted and accounted for, the reality is this most recent decline was seemingly just as surprising to an industry that has experienced these cycles many times before as all the other declines have been over the decades. To quote George Bernard Shaw, We learn from history that we learn nothing from history. While the rally in most mined commodity prices may have been unprecedented in terms of the market capitalization values reached by mining companies, and the commodity prices realized, in many ways it was simply just another cycle in a cyclical industry that very much mirrors the global economic situation. To mirror the industry, copper is an excellent bellwether commodity. In many ways, it is the engine that powers the mining industry and its health dictates global mining (and overall economic) conditions like no other commodity. 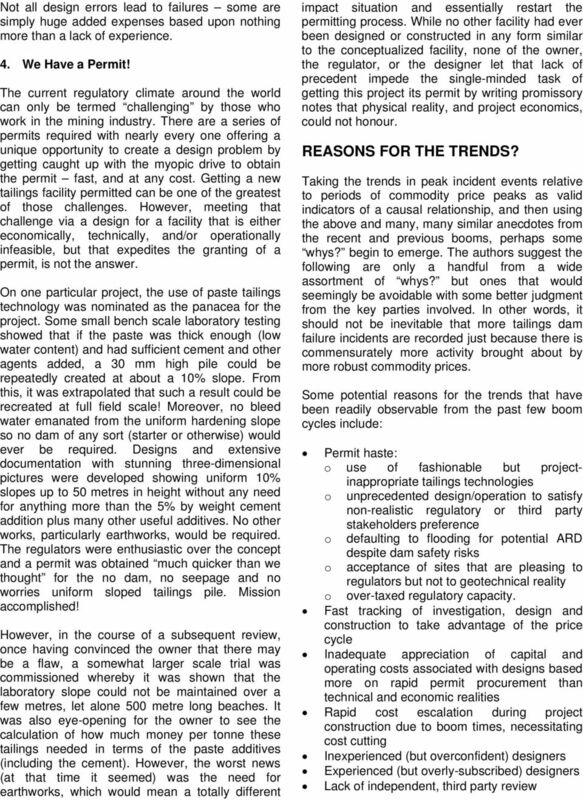 6 ANECDOTES FROM THE RECENT BOOM There is a common discussion question amongst long-term designers of tailings dams during mining booms who is doing all that extra work? The reputable design houses and their senior resources are typically fully-occupied during average economic conditions and can quickly become stretched during peak periods. When a prolonged peak of an unprecedented nature occurs as did recently between 2005 and 2008, it is difficult indeed to imagine where all that additional capacity came into the industry in terms of design, operating and regulatory experience. The complexity of a tailings dam, in comparison to many engineered structures including conventional water retention dams, cannot be overstated. These structures are never at steady-state conditions during operations and are often constructed over decades where the initial portion of the dam may include design criteria and construction practices long out of date. However, what really does occur during boom times that could represent the causal link between the trends noted in this paper? One window into a portion of the reasoning is offered through a few select anecdotes from the recent boom. 1. Following the OMS Manual? At one mine, the Operating, Maintenance and Surveillance (OMS) Manual for the tailings area included a stipulation that the tailings dam and impoundment be visually inspected daily or whenever was convenient (the latter portion was handwritten, word for word, in the OMS manual). Apparently the daily requirement for this dam and impoundment, which was more than five km from the main operations, was onerous so a somewhat lesser frequency was adopted. When the long overdue viewing did take place it was discovered that the tailings line had cracked at a valve on the crest of the dam, eroding a significant portion of the earthfill and allowing tailings to find their way into a stream bed for about two km downstream. During the incident review, it was determined that the job of the daily (or convenient ) was formerly done by someone who had left the mine for another opportunity and they were awaiting some new hire to fill the position but were having problems getting someone. That problem had gone on for 14 months clearly the period between inspections as well so instead of daily, convenient turned out to be about every 400 days. The owners of the mine were impressed with how much damage a cracked line could do when left alone for about 400 days. 2. Interesting Design At one mine, space was at a premium. There simply was very little room for all of the infrastructure and the desired tailings impoundment directly adjacent to the mill. However, an enterprising designer came up with a solution by simply (seemingly) ignoring upstream failure modes. The rock shell was impressive and steep getting to more than 40 m in height at about 1.5H:1V. The dam was being constructed in an upstream manner with tailings and supernatant supporting the rock shell (this was the part the designer did not seem to include in their assessment). When the tailings in the impoundment simply could not take the loading of the rock shell any longer, and it is incredible failure did not occur prior to the rockfill reaching 40 m in height above the tailings, it failed into the tailings beach effectively shutting the mine down for a prolonged period of repair. A post-incident review confirmed no consideration of the upstream support requirement of the beach to the rock shell had ever been considered by the designers who, by their own admission, had only started designing tailings dams. 3. Drainage, Drainage, Drainage! 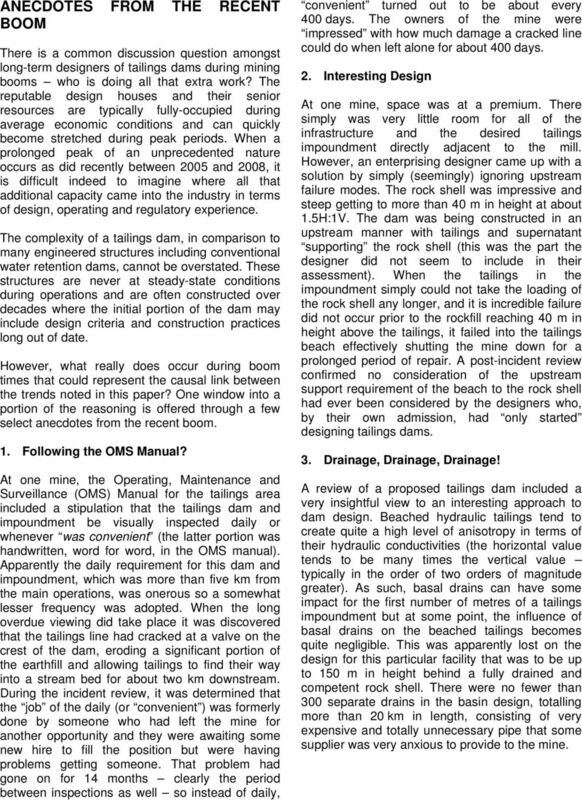 A review of a proposed tailings dam included a very insightful view to an interesting approach to dam design. Beached hydraulic tailings tend to create quite a high level of anisotropy in terms of their hydraulic conductivities (the horizontal value tends to be many times the vertical value typically in the order of two orders of magnitude greater). As such, basal drains can have some impact for the first number of metres of a tailings impoundment but at some point, the influence of basal drains on the beached tailings becomes quite negligible. This was apparently lost on the design for this particular facility that was to be up to 150 m in height behind a fully drained and competent rock shell. There were no fewer than 300 separate drains in the basin design, totalling more than 20 km in length, consisting of very expensive and totally unnecessary pipe that some supplier was very anxious to provide to the mine. 8 Rapid turnover of key mine management and operating personnel as new opportunities abound during the boom times Disconnect between design expectations and operational realities Development of long-known deposits that have been left undeveloped for good reasons Pressures to cut costs for once mines constructed on the basis of rising commodity prices are forced to operate with the reality of lower commodity prices Cookie cutter designs having attributes well and good in, for example, South Africa, but being used for a project in a high rainfall, high seismic environment. The list above is far from exhaustive. However, there is not a single item in that list that would qualify as a justification for the postulated relationship between commodity price booms and tailings dam incidents, and as such merely points to a lack of discipline in sticking with well-established design and stewardship practices. A lack of discipline brought about by the need to make hay while that economic sun shines, even when it leads to another case history in the growing catalogue of tailings dam incidents, is understandable but is not acceptable. 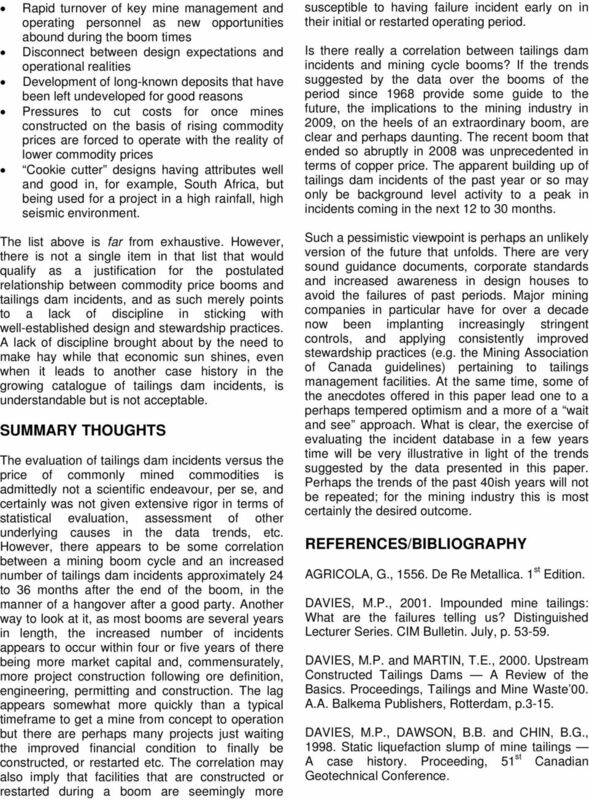 SUMMARY THOUGHTS The evaluation of tailings dam incidents versus the price of commonly mined commodities is admittedly not a scientific endeavour, per se, and certainly was not given extensive rigor in terms of statistical evaluation, assessment of other underlying causes in the data trends, etc. However, there appears to be some correlation between a mining boom cycle and an increased number of tailings dam incidents approximately 24 to 36 months after the end of the boom, in the manner of a hangover after a good party. Another way to look at it, as most booms are several years in length, the increased number of incidents appears to occur within four or five years of there being more market capital and, commensurately, more project construction following ore definition, engineering, permitting and construction. The lag appears somewhat more quickly than a typical timeframe to get a mine from concept to operation but there are perhaps many projects just waiting the improved financial condition to finally be constructed, or restarted etc. The correlation may also imply that facilities that are constructed or restarted during a boom are seemingly more susceptible to having failure incident early on in their initial or restarted operating period. 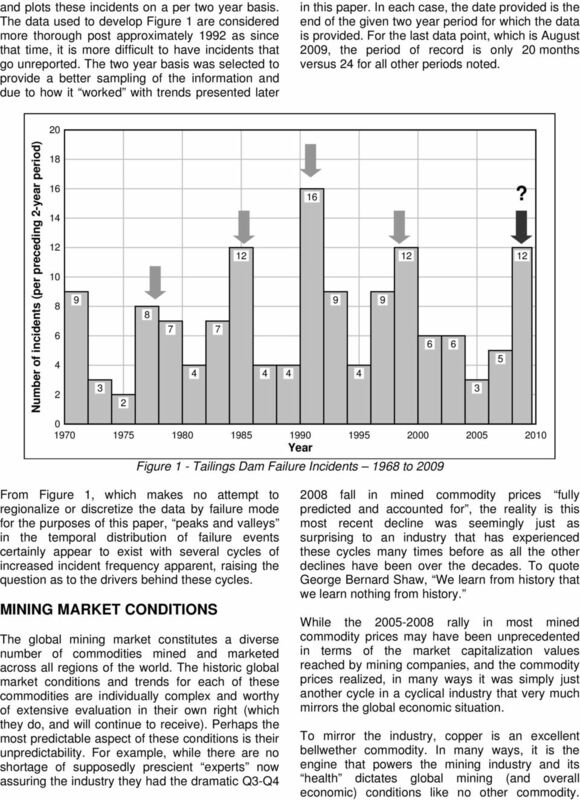 Is there really a correlation between tailings dam incidents and mining cycle booms? If the trends suggested by the data over the booms of the period since 1968 provide some guide to the future, the implications to the mining industry in 2009, on the heels of an extraordinary boom, are clear and perhaps daunting. The recent boom that ended so abruptly in 2008 was unprecedented in terms of copper price. The apparent building up of tailings dam incidents of the past year or so may only be background level activity to a peak in incidents coming in the next 12 to 30 months. Such a pessimistic viewpoint is perhaps an unlikely version of the future that unfolds. There are very sound guidance documents, corporate standards and increased awareness in design houses to avoid the failures of past periods. Major mining companies in particular have for over a decade now been implanting increasingly stringent controls, and applying consistently improved stewardship practices (e.g. the Mining Association of Canada guidelines) pertaining to tailings management facilities. At the same time, some of the anecdotes offered in this paper lead one to a perhaps tempered optimism and a more of a wait and see approach. What is clear, the exercise of evaluating the incident database in a few years time will be very illustrative in light of the trends suggested by the data presented in this paper. Perhaps the trends of the past 40ish years will not be repeated; for the mining industry this is most certainly the desired outcome. REFERENCES/BIBLIOGRAPHY AGRICOLA, G., De Re Metallica. 1 st Edition. DAVIES, M.P., Impounded mine tailings: What are the failures telling us? Distinguished Lecturer Series. CIM Bulletin. July, p DAVIES, M.P. and MARTIN, T.E., Upstream Constructed Tailings Dams A Review of the Basics. 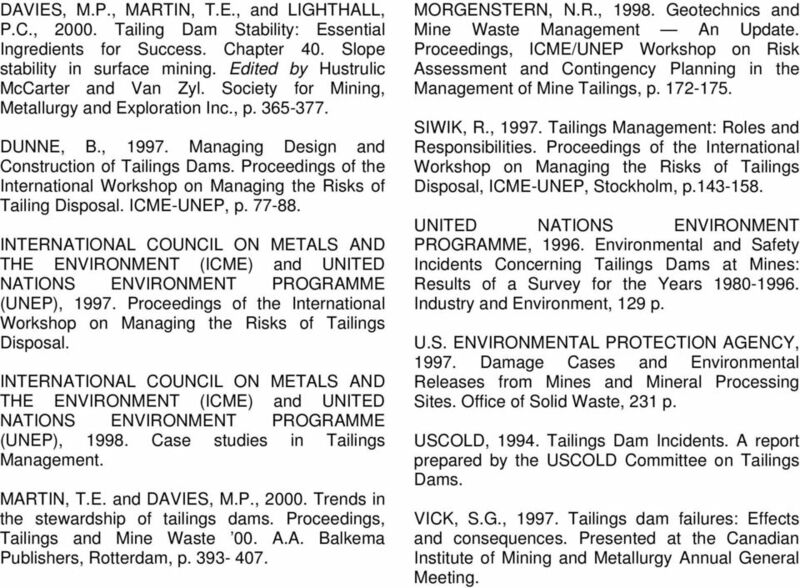 Proceedings, Tailings and Mine Waste 00. A.A. Balkema Publishers, Rotterdam, p DAVIES, M.P., DAWSON, B.B. and CHIN, B.G., Static liquefaction slump of mine tailings A case history. Proceeding, 51 st Canadian Geotechnical Conference. 9 DAVIES, M.P., MARTIN, T.E., and LIGHTHALL, P.C., Tailing Dam Stability: Essential Ingredients for Success. Chapter 40. Slope stability in surface mining. Edited by Hustrulic McCarter and Van Zyl. Society for Mining, Metallurgy and Exploration Inc., p DUNNE, B., Managing Design and Construction of Tailings Dams. Proceedings of the International Workshop on Managing the Risks of Tailing Disposal. ICME-UNEP, p INTERNATIONAL COUNCIL ON METALS AND THE ENVIRONMENT (ICME) and UNITED NATIONS ENVIRONMENT PROGRAMME (UNEP), Proceedings of the International Workshop on Managing the Risks of Tailings Disposal. INTERNATIONAL COUNCIL ON METALS AND THE ENVIRONMENT (ICME) and UNITED NATIONS ENVIRONMENT PROGRAMME (UNEP), Case studies in Tailings Management. MARTIN, T.E. and DAVIES, M.P., Trends in the stewardship of tailings dams. Proceedings, Tailings and Mine Waste 00. A.A. Balkema Publishers, Rotterdam, p MORGENSTERN, N.R., Geotechnics and Mine Waste Management An Update. Proceedings, ICME/UNEP Workshop on Risk Assessment and Contingency Planning in the Management of Mine Tailings, p SIWIK, R., Tailings Management: Roles and Responsibilities. Proceedings of the International Workshop on Managing the Risks of Tailings Disposal, ICME-UNEP, Stockholm, p UNITED NATIONS ENVIRONMENT PROGRAMME, Environmental and Safety Incidents Concerning Tailings Dams at Mines: Results of a Survey for the Years Industry and Environment, 129 p. U.S. ENVIRONMENTAL PROTECTION AGENCY, Damage Cases and Environmental Releases from Mines and Mineral Processing Sites. Office of Solid Waste, 231 p. USCOLD, Tailings Dam Incidents. 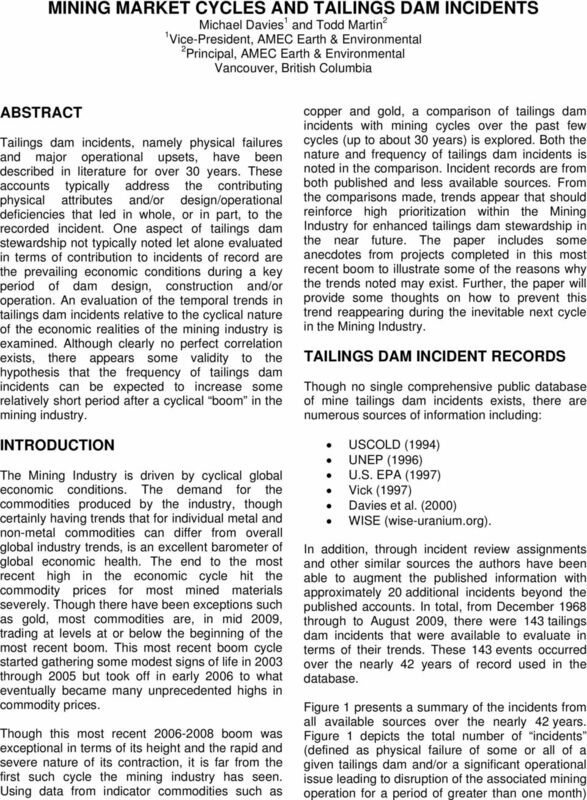 A report prepared by the USCOLD Committee on Tailings Dams. VICK, S.G., Tailings dam failures: Effects and consequences. Presented at the Canadian Institute of Mining and Metallurgy Annual General Meeting. November 20, 2014. The key points included in the November 20, 2014 document are included below where necessary. 1.0 SUMMARY The effective date of the mineral resource estimate is 17 April 2011, which represents the cut-off date for the most recent scientific and technical information used in the resource estimate. ACM Courses. Management and Organization Department. Ramon V. del Rosario College of Business. De La Salle University. Sample Micro Hydro Initial Report Sample Micro Hydro Initial Report Introduction The Hydro Burn at Glen Water was visited by Richard Haworth of Glen Hydro to assess its suitability for a micro hydro installation. Hello! This document is designed to provide all the information you need to ensure the smooth delivery and installation of your spa or swim spa. control manual Optimal maintenance decisions for asset managers by andrew k.s. jardine and neil montgomery 44 Industrial Engineer Most of us are familiar with the effort involved in purchasing a new car. Getting the most out of contact management software Received (in revised form): 14th May, 2002 Nigel Pleasants Nigel Pleasants is President of Increase Sales!, a division of Media Marketing Management. PREVIEW COPY. The picture is not clear. How many CCTV surveillance cameras in the UK? A study by the BSIA. July 2013. Form No. 195 Issue 1. John Keel, CPA State Auditor. An Audit Report on The Dam Safety Program at the Commission on Environmental Quality. May 2008 Report No. When it comes to supply risk, advanced procurement organizations are most in danger because the actions they have taken to generate savings and results have increased their risk as an unintended consequence. A new approach to rail asset management. THE DCAA AUDIT Created to oversee government spending on behalf of the American tax-payer, the Defense Contract Audit Agency (DCAA) is responsible for supervising all Department of Defense (DoD) contracts. Benchmarking Report B2B Email Marketing Effectiveness Benchmarks, Insights & Advice Navigating the Minefield to Inbox Placement Sponsored By: 2013 Demand Metric Research Corporation. All Rights Reserved. Erosion and Sediment Transport Monitoring Programmes in River Basins (Proceedings of the Oslo Symposium, August 1992). IAHS Publ. no. 210, 1992. 391 A sediment monitoring program for North America W.R. When it comes to the supply risk, advanced procurement organizations are most in danger because the actions they have taken to generate savings and results have increased their risk as an unintended consequence. Win-win negotiation: becoming a reality? A Primer in Internet Audience Measurement By Bruce Jeffries-Fox Introduction There is a growing trend toward people using the Internet to get their news and to investigate particular issues and organizations.